These have been popular in our rural community for a long time. We got them from our neighbour Marge, whose family got them from another neighbour 40 years ago. Now we grow Lavatera every year for its enchanting pink flowers, and the odd rare plant will have all white blossoms. Sow in early to mid-spring, 1 cm (3/8 in) deep - germination is slow, be patient. Thin to 30 cm (1 ft) apart. Full sun, grows to 90 - 120 cm (3 - 4 ft) and may require support in windy locations. Can be grown in a bush or hedge format. Flowers start in late July, with blooms peaking in August. 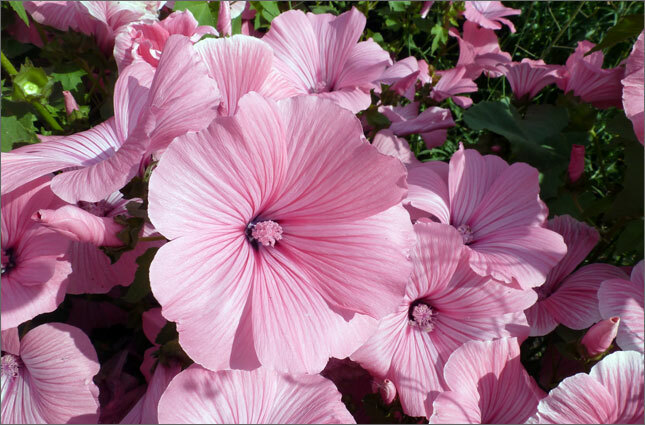 Resembles hollyhock or hibiscus. Annual, but dead head or collect the seed heads if you don't want Lavatera to self-seed.